What is the scientific basis for good eyesight without surgery? Q: Is there a scientific basis for your vision? Many people say I'm getting better. Then you have to report to the academia and prove your credibility. However, many ophthalmologists say that your eyes can never get better. Why? Are they stupid? If you can, please justify. This is the question mentioned in Boramaenun video our product related. The two lens are combined to form an exact image on the retina to recognize the object​. Myopia progression with fixation of a near-life attitude (a situation where a thick lens is not returned to its original state) occurred​. Therefore, when working within one meter, the thickness of the lens should be thinned by looking long distance object about 20minutes intervals. 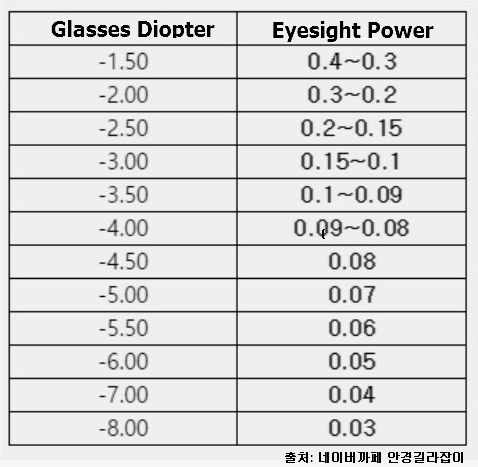 The Diopter is the number of vision known to the public as a unit of refractive power of a lens. ​As a symbol, use D or Dptr. Use positive sign (+) for convex lenses. 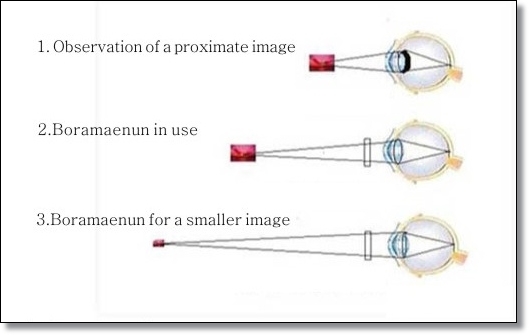 Use the negative sign (-) for the concave lens. It is widely used in one's lifetime to mark the prescription of eyeglasses. For example, if myopia -1D has deteriorated, it means that 1/0.25 = 4, i.e. level 4, is worse than normal eyesight. A worsening nearsightedness -3D indicates that 3/0.25 = 12 or 12 stages are worse than normal eyesight. The Nobel Prize-winning in 1911 ophthalmologist Gullstrand studied and confirmed eye diopter values which used in modern optics. But he confirmed the cornea 43 diopter without the role of eye lens is a crafted assumed value. 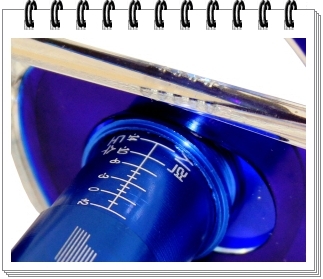 What is the center of focus of the three synthetic magnifiers such as the eye? The average length of the adult eye is 24mm. As a combined lens of cornea and lens our eye focus center locate on eye lens center. 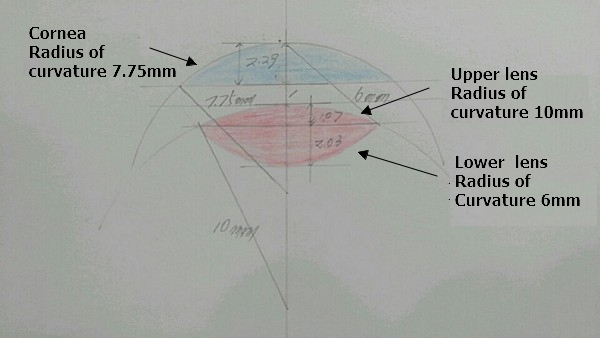 The exact anatomical focal distance to the retina is 24-2.29-1-1.07 = 19.64mm. ☞ If you look outside one meter, your eyes will not get worse. At that environment the lens is tense, when the tension lasts too long and lens lost chance to go back to normal, for this reason, myopia progresses. ​ 1. 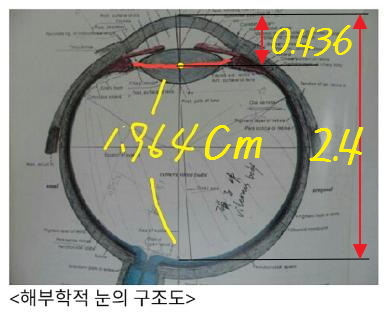 Read book 30Cm distance << 2.5D thick street >> is actually the eye worsening distance. Eliminate tension in the middle of reading by looking at far distance objects. 2. In the case of watching TV, it is a matter of the intensity of the light of the electronic devices over 1m. Use a small TV and reduce the brightness to help protect your eyesight. When you measure distance of most clear book letters from your eye​ within 1meter that diopter related measured distance on table is your current worsened eye diopter level. This means that the eye lens has become three diopter thickened. by close-looking lifestyle. = The focal length is shortened by a thick diopter distance, which means that the focal point is located in front of the retina (1.1mm). 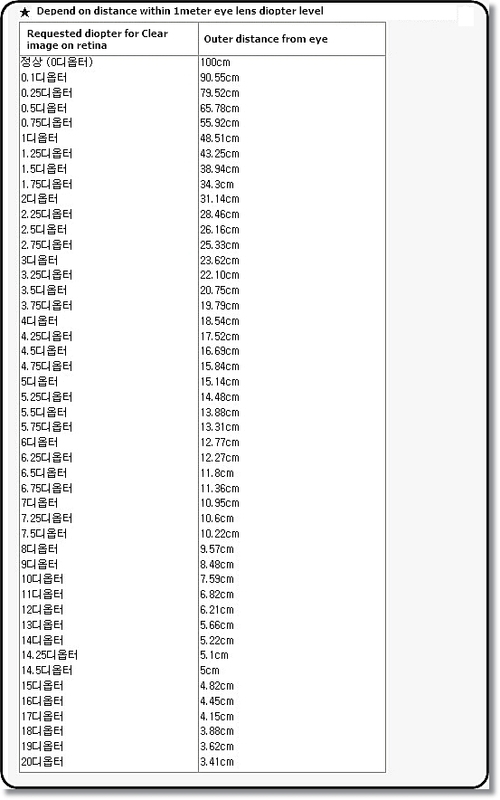 = To correct this (to focus on the retina) means -3 diopter concave myopia glasses are needed. The focal length is 100 / 53.92 (50.92 + 3) = 1.854cm, which means that the lens is thicker by 3 diopter. 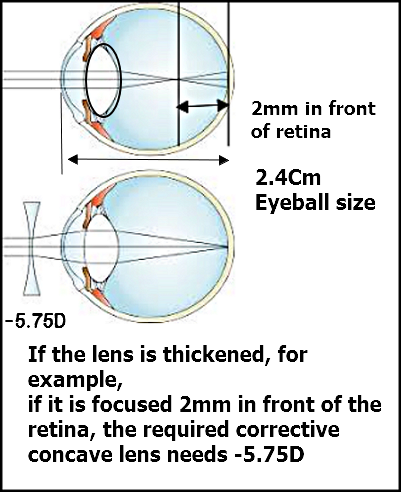 Retina focal length 1.964-1.854 = 0.11 cm. 1.1mm It means that the image is formed in front of the retina. 2 mm (1,964 mm - 2 mm) in front of the retina means 100 ÷ 1.764 = 56.68 D 56.68 - 50.92 = 5.76 diopter. Usually, a child grows about 2 mm in eyeball growth until he / she becomes adult, so about 5-6 diopter of vision is lost. Why do my eyes become so near-sighted as I grow? 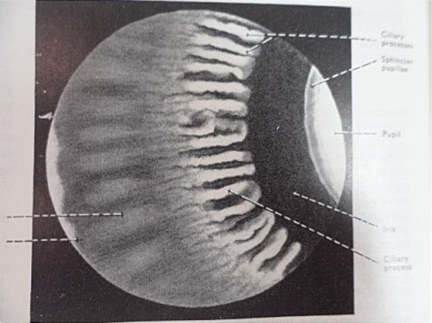 The cornea, lens, and eyeballs grow 2mm in diameter, from child to the adult but the function of the lens variable function is degenerated (getting thicker). In addition to the initial myopia (a situation where the focus is not accurately focused on the retina), the eyeball gradually increases in proportion to body growth to 2 mm. 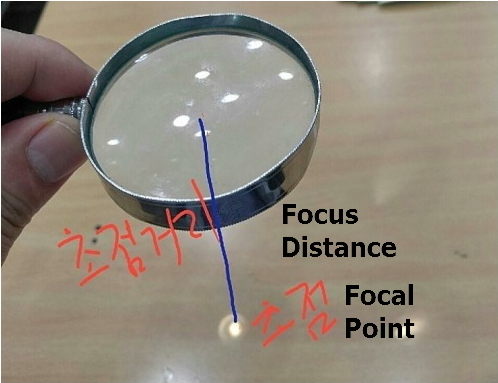 The focal length of the retina is gradually increased toward the front side in proportion as body growth, become blurred eye gradually and a high concave lens is necessary. Solution: To maintain the elasticity of the eye lens, you need to lower your glasses dependency. 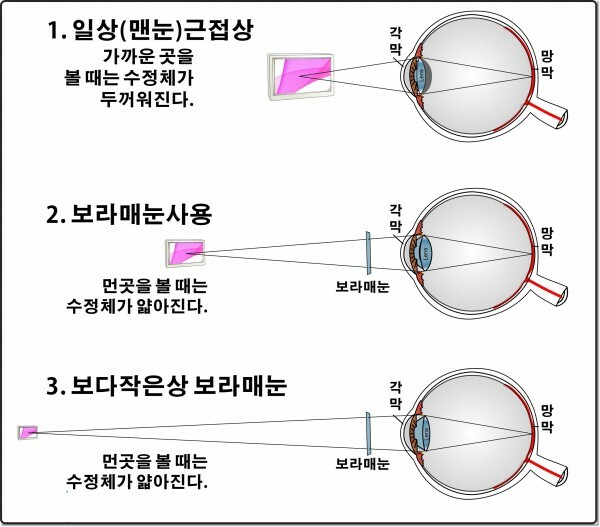 It is necessary to use a thin eye lens as usual by adjusting the glasses to 0.8 level. When you look close, you only need glasses when you need to remove the glasses in the distance. 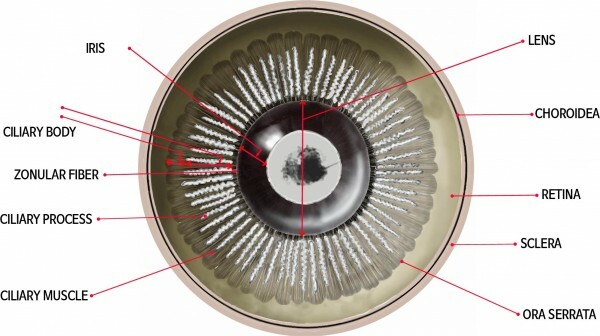 Even if the size of the eyeballs is 21 to 27 mm, the low vision is not a matter of merely the length of the eyeball being longer or shorter than the average (24 mm), but it is a matter of variable lenses that act as focusing on retina could be accurately focused or not The current state of the lens function (emmetropization - making a clear image on the retina by adjusting the refractive index)is uttered necessarily. 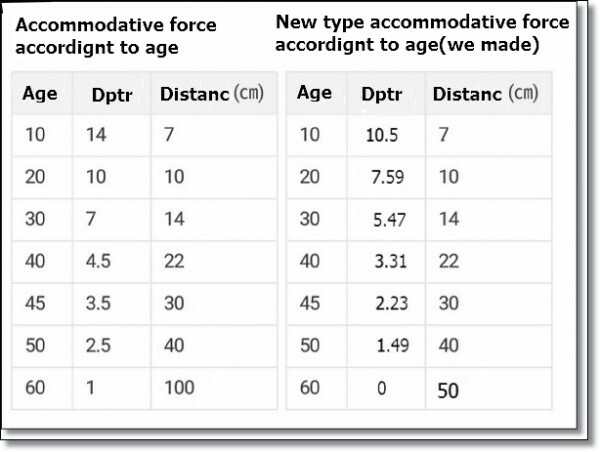 That lens formula only adaptable on 10D lower level, It does not correct in high magnification of 50D of our eyes. According to eyeball grows inevitably these situational factors may make the visual impairment feel worse every 6 months. 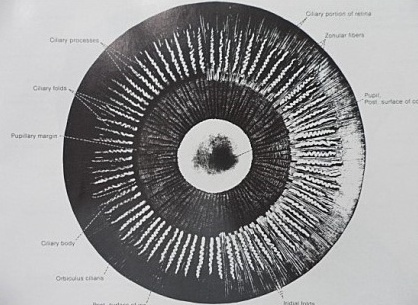 ▶ In ophthalmology, the function of the lens and its ciliary muscles activities were not dealt heavily. "Theory of Axial Myopia" was insisted. Because the Nobel Prize winner Gullstrand in medical science made basic theory of eyeglasses with the erroneous assumption of the theoretical formulation by wrong framing numeric formula usages. For more than 100 years without any attempt to find a contradiction in Gullstrand theory they accepted those values just like God's saying. They even takes a look at myopia as a genetic cause. A person with myopia (ophthalmology doctors insist axial myopia person),after LASIK, LASEK Surgery has 1.0 or more eyesight. According to theory from now on there are no other worsening eyesight factors because eyeball size is not grow and maintained current adult size and eyesight is over 1.0 eyesight power. Under those situations eyesight can not be reduced by axial myopia elongation theory. 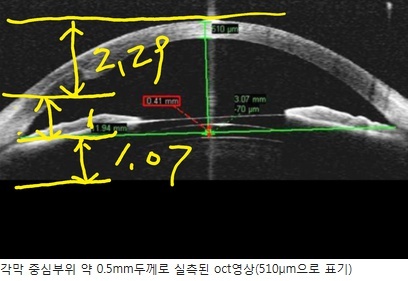 Eye lens of the human can be as bad as -17D and if the corneal thickness is safe, corneal surgery can be corrected to almost -8D. Even after normal correction over 1.0, the variable eye lens is a lens that thickens continuously (up to -17D) change. If you continue to behave bad activities at close range It means that visual degeneration occurs until -17D. Although they accept -14D variation on age basis The existed theory of "axial myopia" ignore that the lens is the main factor of eyesight deterioration. and it need theoretical establishment again as lens thickness leading to a reduction in visual acuity due to the advancement of focus from the retina. It is common sense that the thicker the eye lens the shorter the focal length became. There are more than 80 cilliary muscles that control the lens thickness. Degenerating with age, or due to differences in muscle strength, the axis of the lens shifts, which is the cause of myopia and astigmatism. Even if the tire balance is correct at the time of shipment of the car, the inside or the outside of the tire worn out over time, in order to prevent the inconvenience of the steering wheel operation, the car needs tire balance control. The principle of recorrecting the lens function is to correct the vision by using a Boramaenun(Hawk eye) trainingl to take a thin lens. Over a long period of time, over 80 different cilillay muscles have been unbalanced and lost original shift location a little, this is cause of astigmatism. 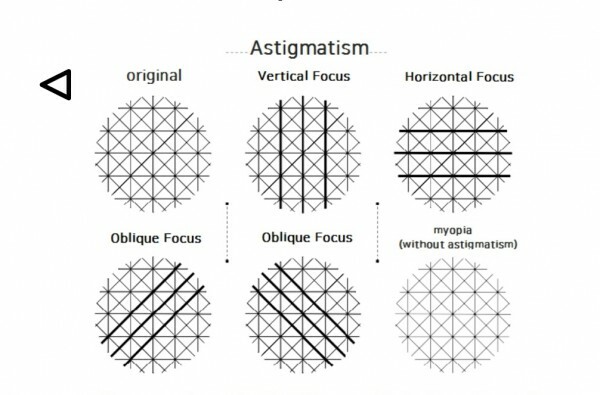 Astigmatism can be corrected in little by little through the astigmatic grid cap training and astigmatic training application. With astigmatic training cap on, it is -3 diopter lower than the sight of oneself in training devices. You can check your current astigmatism status at the same time. In the application, astigmatism can be detected by setting a certain distance. For detailed training methods, refer to the following video tutorial​ and app explanation. Eyesight Training: astigmatism" search, download and install. ​Strengthening the cillary muscles to control the degree of refraction can improve vision slowly. The lens must be thin to see the distance, and the lens should be thick enough to look close. Give a modern person who can live only in a narrow space to see,long distance mountain looking effects and thinnin the eye lens and strengtheing cillary muscles power. The most clearest graduation is the current state marked number on the tube. Ophthalmologists do not know this fact they claims there is no other way of recovering eyesight except the surgery. it is very absurd using word "never" meaning in the world.